Ever since Twitter became a publicly traded company, the platform has worked tirelessly to find ways to increase their revenue. Unlike most situations where a company is trying to increase its revenue, Twitter’s plans are beneficial to the marketers who use the social media network since Twitter is searching for better ways to connect people to their target audience. Last week, Twitter announced that they would open up their new objective-based ads to all marketers which gives businesses new ways to setup and manage their Twitter ad campaigns. Objective-based ads work similar to the objectives for ads on Facebook. The objective of the ad determines what kind of engagement the advertiser pays for. There are six kinds of objectives. Tweet engagement ads charge for every click on a Tweet. Website conversion ads charge for link clicks. Similarly app install or app engagement ads charge for clicks on the app or app installs. Ads for followers and ads for Leads charge for new followers gained or leads submitted. There’s also a beta for video view ads. It’s easy to setup objective-based ads. When creating a new campaign, marketers can select from one of six objectives. Then, a customized workflow will help the user choose the best ad format for your goals, set up the PPC and get the ads started. So when an advertiser sets up an ad for website clicks, they’ll be charged when a user clicks on a link to your website and all other engagements, such as Retweets, are free. The campaign dashboard surfaces the metrics that are most aligned with ads objectives, such as the number of link clicks, video views or app installs, and the cost per result. Twitter also provided a few testimonials from brands that tested the beta, like eBay. The data analytics firm Tableau found that Objective-based pricing reduced their cost per link click by over 40 percent quarter over quarter, which meant their ads were more efficient, with higher lead conversions rates. Similarly, Gupta Media was able to deliver a 24 percent conversion rate on Twitter — double the average conversion rate compared to other advertising platforms. 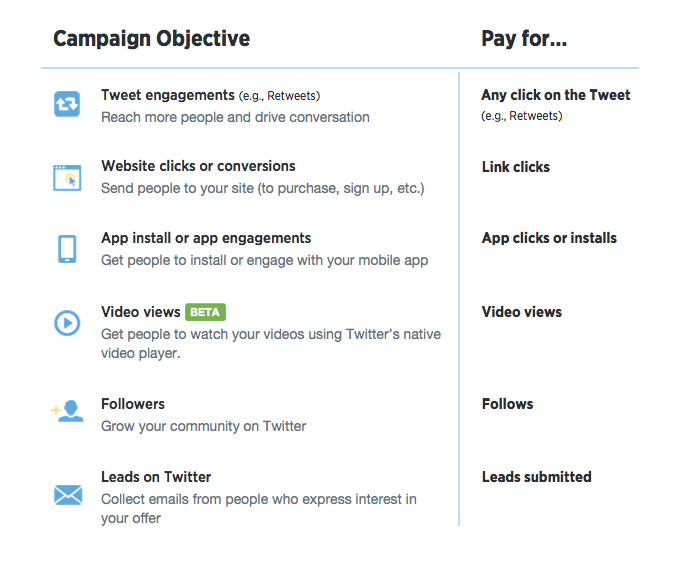 Objective-based ads make Twitter a much more useful platform for marketers. Being able to tie ads to a specific goal helps marketers create targeted campaigns and lets them spend more money on the engagement that matters. This plan will also benefit Twitter. Objective-based ads demystifies the process of creating effective ads on Twitter, which means more business owners will use them. For more information about big things happening at Twitter, read this article on the start of a new collaboration between Google and Twitter.